When it comes to the fanciest DIY monogram letter projects, you just can’t go past this bumper round-up! Not only are these tutorials simple and fun, but many of them also use common craft items which you may even have laying around at home. Whether you’re after some personalized home decor or a treasured gift for a loved one, you’ll find it all in the clever craft projects below. How great are these teacher gift ideas featuring crayon monograms from A Mom With a Lesson Plan? They’re bright, bold and eye-catching! Now you can turn your favorite vintage plates into monogrammed masterpieces, thanks to this wonderful tutorial from Angel in the North! You can either feature your initials or spell out an entire word just as this blog has done. Complement your cakes with messages as artful as your designs. Add custom lettering and monograms to your cakes using an inspiring collection of techniques. Burlap is the perfect material to really make these bright and quirky monograms pop! At the Picket Fence has an instructional step-by-step guide to help you recreate your own. How fun are these DIY pom pom monograms from Bespoke Bride? They’re also super easy to make, and something that the kids will want to get involved in too! Capitol Romance has this fantastic tutorial to teach you how to create glitter ombre monograms to decorate your house with or even give as gifts – Genius! These gold sequin adorned monograms from Catch My Party would serve as the perfect decorations at weddings, baby showers, and more! The good news is that they’re also very simple to create, so be sure to check out the tutorial! These yarn-wrapped monograms from Catch My Party are stunning! They also require very little ‘creation time’, so can easily be knocked over this afternoon. Even if you’ve never tried quilling before, you’re sure to be amazed by this DIY monogram project from Craftastical! You can also mix and match your colors to create a new and unique look. Craft Cuts has had the brilliant idea of combining a house number with an initial to create a totally unique sign for your house! You’ll also love the easy-to-achieve chevron design. Everyone likes a bit of bling, so this DIY monogram project idea from Cynthia Banessa is sure to be a crowd-pleaser! These are incredibly eye-catching too and would make cherished gifts for loved ones. Not your average floral monogram, this design idea from Decoist can also be framed and hung on a wall to admire for years to come! Stunning! Just be sure to use fake flowers of course. Here’s another DIY monogram idea with a difference! Eclectically Vintage has shown us how to make a monogram on glass to produce an antique window-like effect. Amazing! Do you want rose gold letters for an upcoming event, but without the price tag? Fancy Pants Weddings has the perfect solution for you with this DIY monogram tutorial! Give your home décor a glamorous coastal aesthetic by recreating one of these gorgeous seaside monograms from Glamorous Addiction! It’s also a budget-friendly DIY, which you’re sure to love! Succulents are everywhere at the moment, so it only seemed fitting that we included a marvelous DIY succulent planter monogram from House and Fig. It’s low-maintenance too! These black and white photo monograms are perfect for everything from graduation celebrations to engagements, weddings, and simply just to celebrate a birthday! House on the Way has this fantastic DIY tutorial. This beautiful monogrammed letter tutorial uses eye-catching buttons and a vintage-inspired frame to top it all off! You won’t want to miss this DIY project from I Heart Nap Time. Here’s an Anthropologie inspired monogrammed letter which won’t break your budget! Life in Velvet has come up with this beautiful project, so be sure to check out her step-by-step guide! Lil Luna wanted to create a carnival inspired marquee monogram light, so decided to create her own and document the process! Luckily for you, you can follow her steps to also create your own version. Washi tape comes in handy for just about everything these days, and here’s another example of how you can use the humble tape to transform your monogrammed letter art – Too easy! You’ll love this project idea from Living Locurto. Did you know that you can also turn your monogrammed letters into a unique magazine holder? The fabulous blog Living Well Spending Less has this great tutorial for you to follow! This DIY letter shaped Christmas wreath is easily achievable thanks to this YouTube tutorial by the one and only Martha Stewart! Now you can see her steps in video format to really help you recreate this letter project. Modern Mommyhood has a fantastic glitter letter tutorial which will have you creating sparkly, blinged-up monograms in no time! Everyone loves a good ol’ Anthropologie hack, and you’re sure to love these DIY industrial monogrammed letters from Retropolitan. They’re both fun and simple to create too! Do you have fabric scraps laying around at home? Sarah Sutin shows us how you can use them to create these lovely and eye-catching letters! Although this one isn’t a step-by-step tutorial, this seashell-adorned letter created by Seashell Collection will provide enough inspiration for you to also create your own! Use your own collected seashells from holidays for that special touch, or you can also buy seashells from your local dollar store or eBay. This is what happens when you combine two fantastic trends right now (florals and succulents) and use them both to create a monogram. Pretty amazing, right? You’re going to love this instructional guide from Swell Mayde. This DIY turf letter from That’s My Letter is amazing! Fancy hanging one of these on your front door to greet guests? Check out the tutorial to see how. We love the versatility of these fancy DIY monogram letters from This Heart of Mine – especially that mermaid-inspired one! Children and adults alike are going to adore these too! If you’ve got a spare hour, some twine, and a wooden letter lying around the house, why not create this DIY hanging letter from Two Twenty One? It looks amazing when displayed on the front door too! 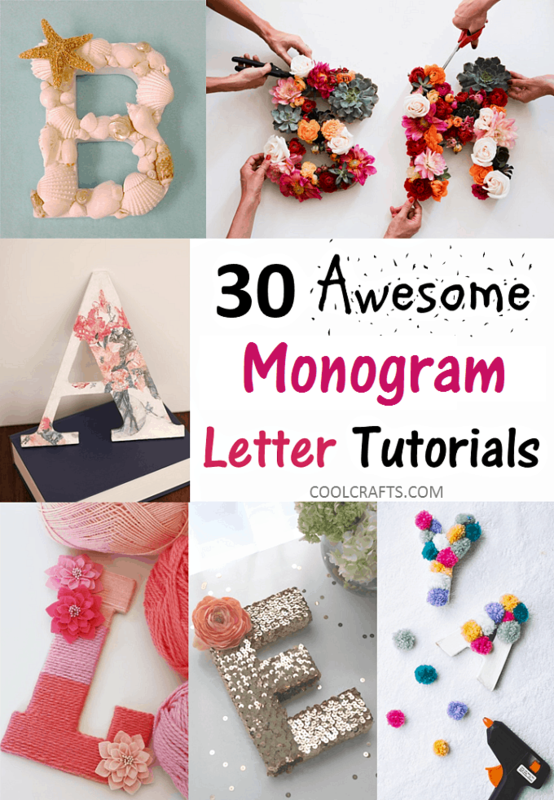 Will you be creating any of these monogram letter projects? Which one is your favorite? We’d love to hear your thoughts in the Comments section below!